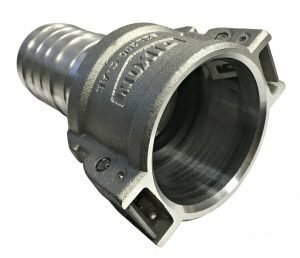 New EZLink™ Armless Cam and Groove Couplings have a push-to-connect low profile design that completely eliminates the cam arm. Cam arms can wear out, break, open under high vibration, and can be difficult to close in tight or oily applications. The EZLink™ coupling has a patent pending spring-loaded locking clasp on each side that allows a click into place connection, and a thumb tab disconnect. Disconnection is not possible when line pressure is over 20 PSI. Easily convert your current hose systems as these couplings will mate with a standard male cam adapter. EZLink™ couplings feature a bellows style innovative cam gasket that allows a tight leak-free seal and low compression set for long service life. EZLink™ is also more economical than many locking cam arm style couplings. Now with a limited lifetime factory warranty on breakage of all EZLink™ tabs, pins, & springs. 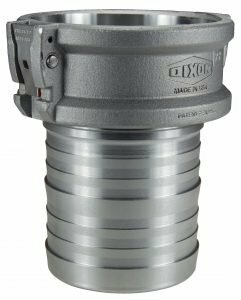 Available in stainless steel and aluminum, these couplings offer the latest in safe and reliable cam coupling innovation.